All webmasters want their sites to load as fast as possible. One of the best ways to speed up a website is to optimize its images. We have already covered various powerful services (such as Kraken.io) that let you optimize the images you have already uploaded. The Compress JPEG & PNG Images plugin is another tool that lets you make your site load faster by compressing JPEG and PNG images. This simple plugin lets you choose which of your images you would like to optimize. 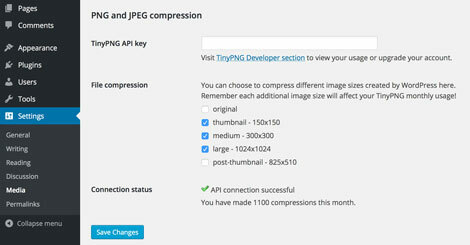 Once you have provided your TinyPNG API key, the plugin lets you compress different images sizes created by WordPress. 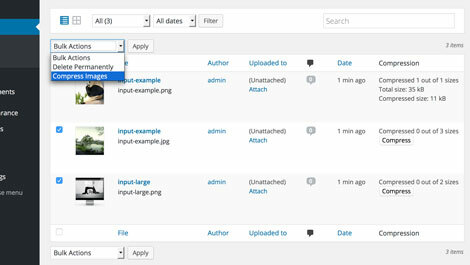 In fact, you can bulk compress your complete library with one click. The plugin is available for free, but you are going to need to pay a fee if you have more than 500 images to compress. Results will vary, but the tool is capable of compressing your images by up to 80%. You can find out more here.